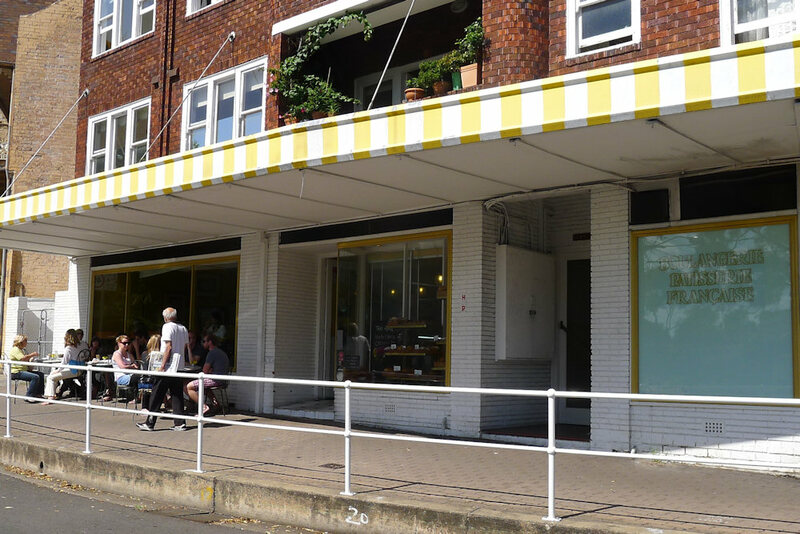 La Gerbe D’or is a gorgeous little French patisserie and café near fiveways in Paddington. There was a constant stream of people coming and going with boxes and bags of delicious-looking foods. 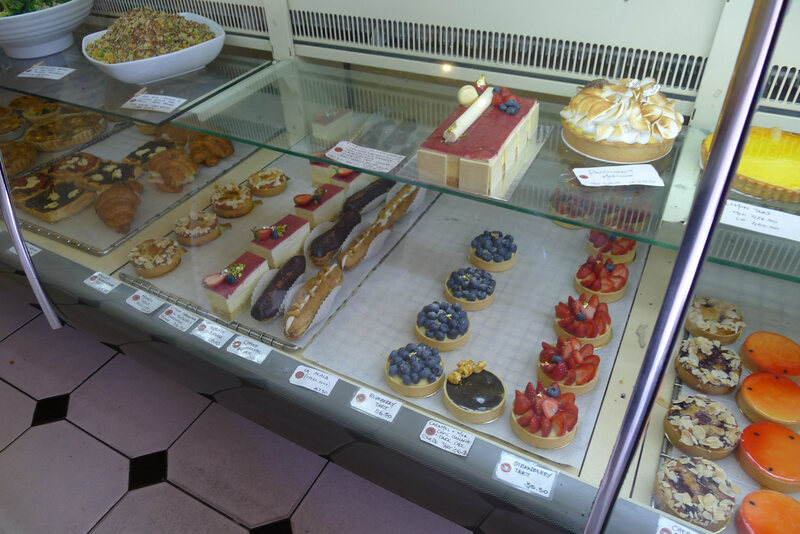 The locals sure know where to go for top quality cakes, pastries, pies and desserts. Now is the perfect time to order hot cross buns and the ones at La Gerbe D’or looked fantastic. Dine in space is limited as there are only three tables and a counter inside and three tables outside. Gentle instrumental music made for a relaxed vibe and scents of bread and pastries wafting from the kitchen was enough to make our mouths water! Waitstaff were quick to take our orders and deliver our food despite having to man the busy counter. There is no drinks menu so we asked the waitress: a selection of bottled drinks (including San Pellegrino & Coca Cola products), coffee, iced chocolate and freshly squeezed orange juice. 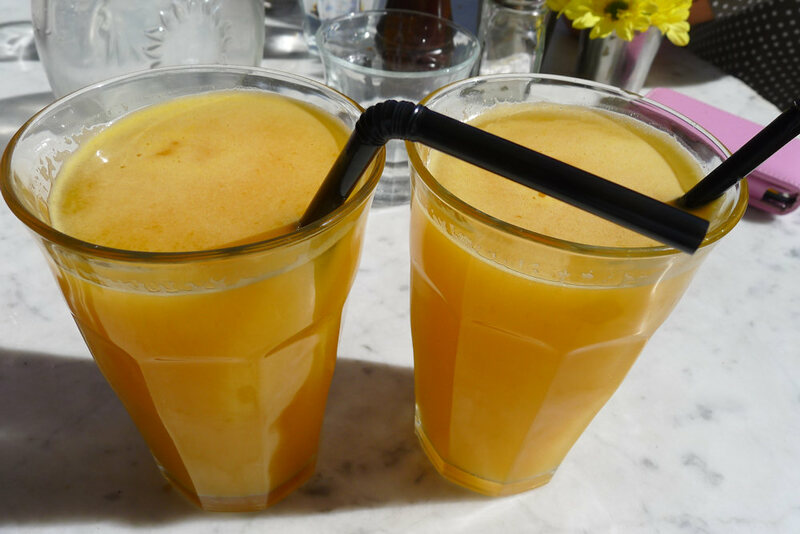 We ordered some of the latter and thought it was nice to have the choice of some fresh juice even though juices are not a main feature on the menu. The iced chocolate was not as chocolatey as we were expecting so if you’re after a strong, sweet flavour, stick to the pastries. 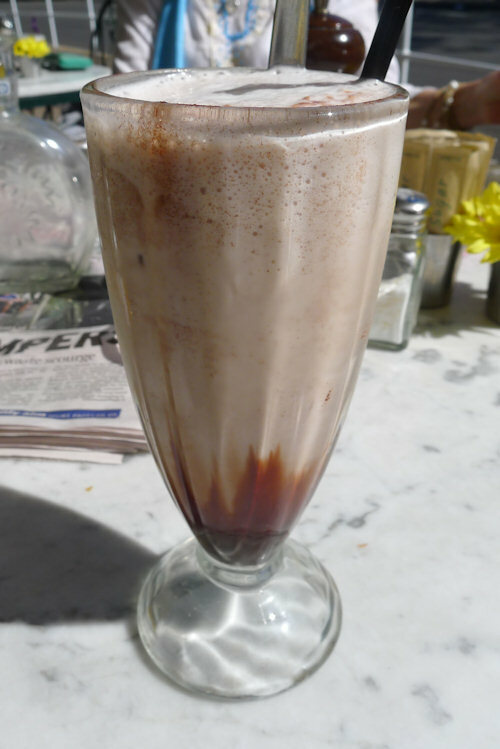 It was well chilled however and actually worked very well with the sweet foods – a regular chocolate shake would have been too overpowering. The coffee was one of the high-points of the morning. 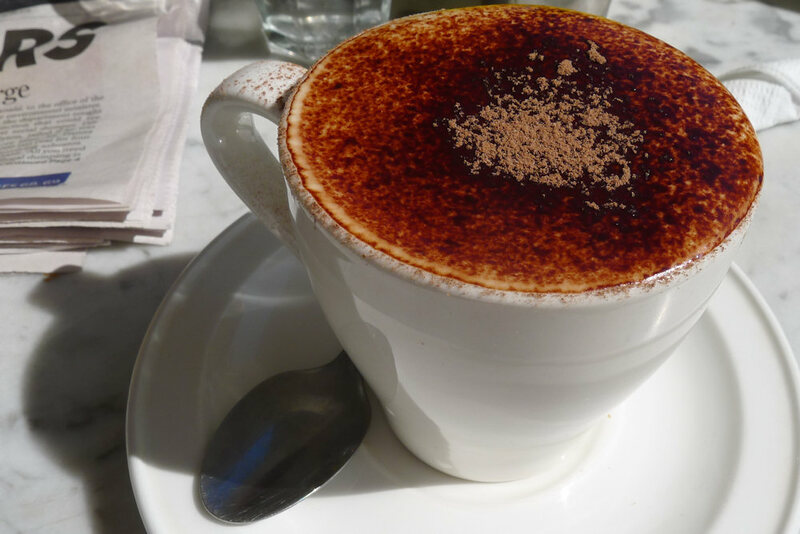 Our skim cappuccinos tasted delicious and expertly brewed. 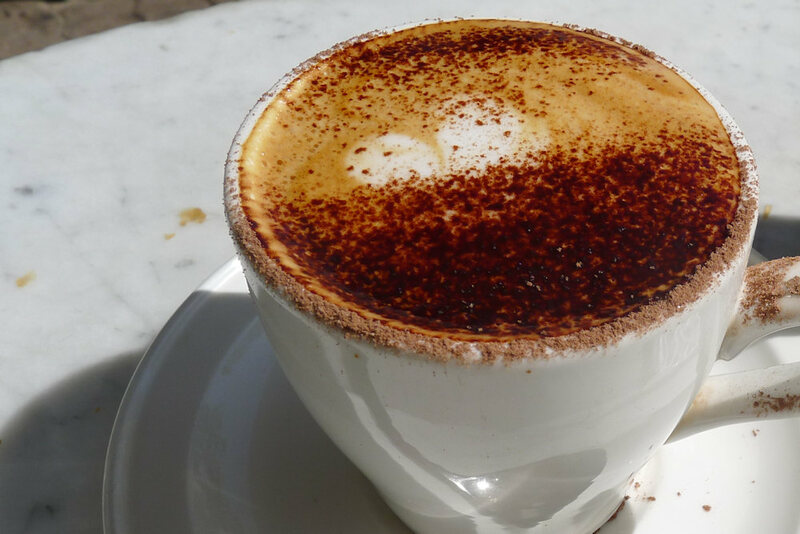 For a change our soy decaf cappuccino was delicious. They use Bonsoy which doesn’t have the horrible aftertaste of some soy milks. Two guests ordered the bacon, lettuce and tomato sandwich ($11.90) and shared it (see the two halves above). They had nothing but compliments for their food. 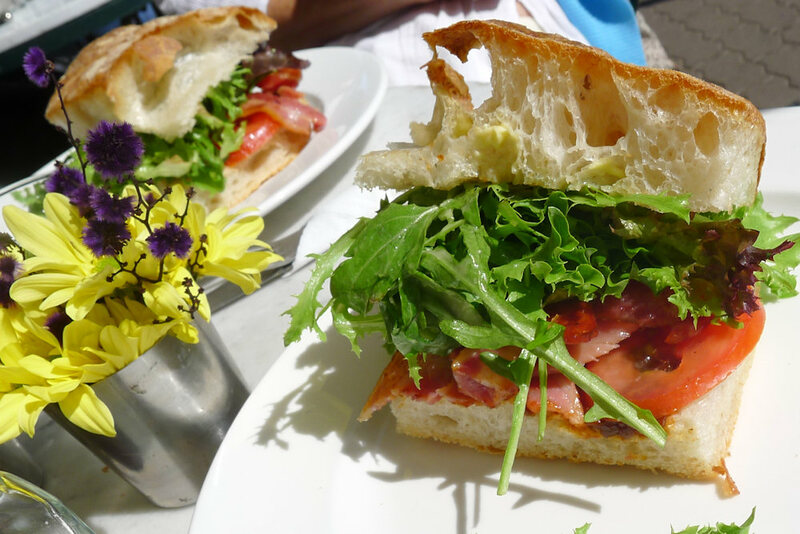 The ciabatta was very airy so it was actually quite a light meal. The house relish on the sandwich was particularly good and on request the chef took our number and promised to make us some! The flowers on the table were also stunning. We managed to capture them in the photo above. A great touch to the fantastic dining experience. It’s great to see simple and inexpensive options on breakfast menus. 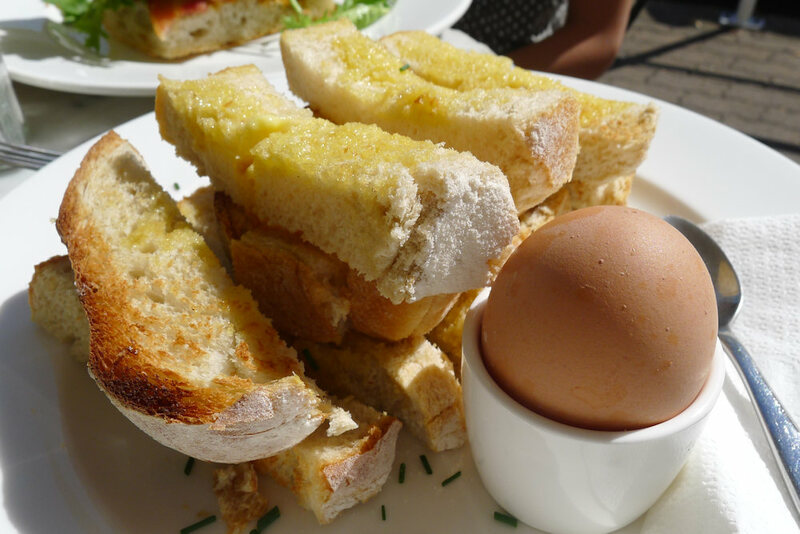 The boiled egg with soliders ($6) came with a mountain of bread and a perfectly boiled egg. The yolk was still runny so we could dip our soldiers in, a highly satisfactory experience. There was still bread left over so we ordered extra jam and ate it all up. 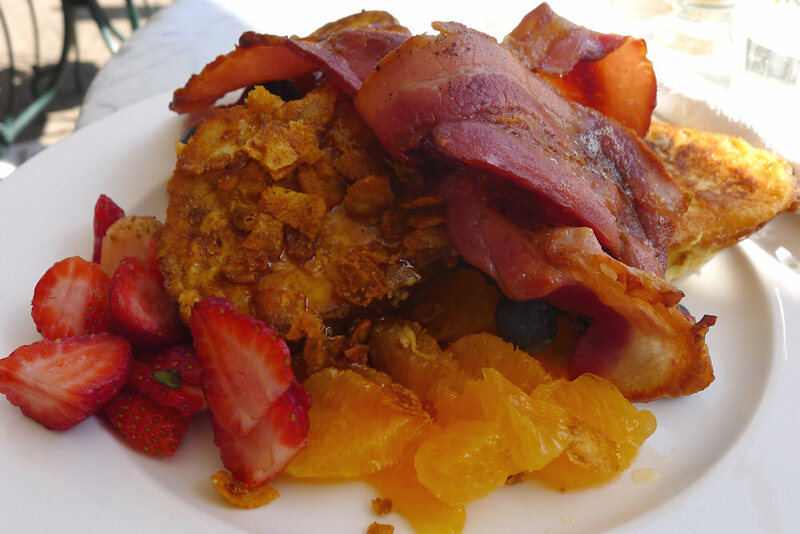 The house challah French toast ($12 or $13.50 with bacon) was a sight to behold. The generous portion included three slices of the toast and fresh strawberries, blueberries and orange. This was all covered with a good amount (ie not drenched) of maple syrup and topped with plenty of lean bacon. The toast was moist and had plenty of flavour. Everything else on the plate worked so well with the toast – the fresh fruit was something that we don’t see often (and not enough) with French toast. The theme of well priced, large dishes continued with the mushrooms, parsley and thyme ($15). Chives are thrown in for good measure and the mixture tasted fantastic. 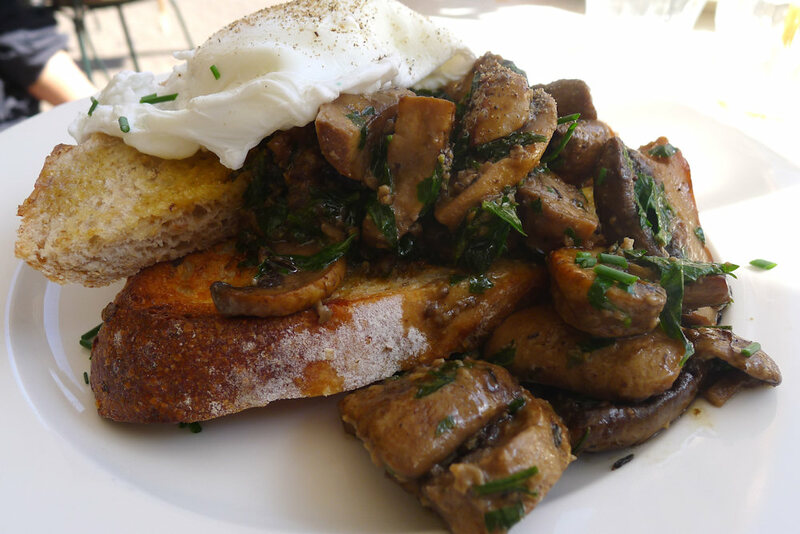 The slices of ciabatta were topped with two perfectly poached eggs. This is where the real fun begins. 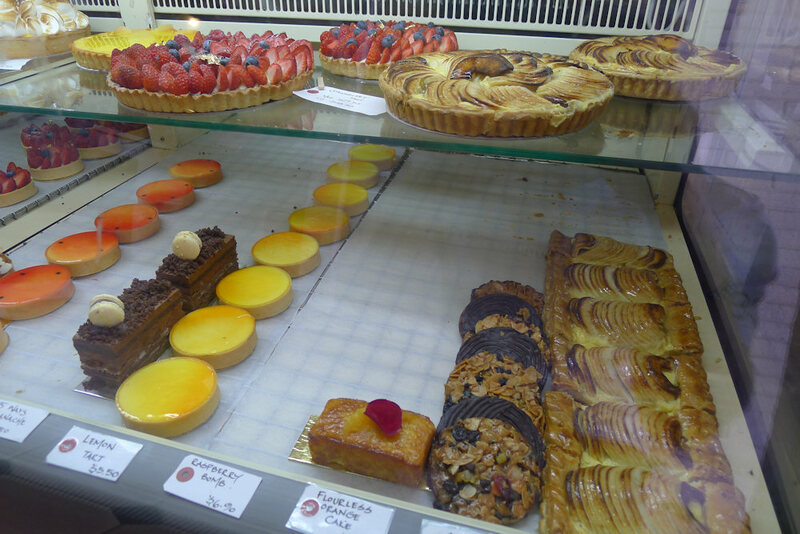 Readers, you are not permitted to go to La Gerbe D’or and not sample their tarts, pastries or sweets. The raspberry and chocolate bombs ($6.50) were brought out from the kitchen after we arrived so they were super-fresh. Pardon our lack of terminology for French sweets but we’ll do our best to describe what we had! 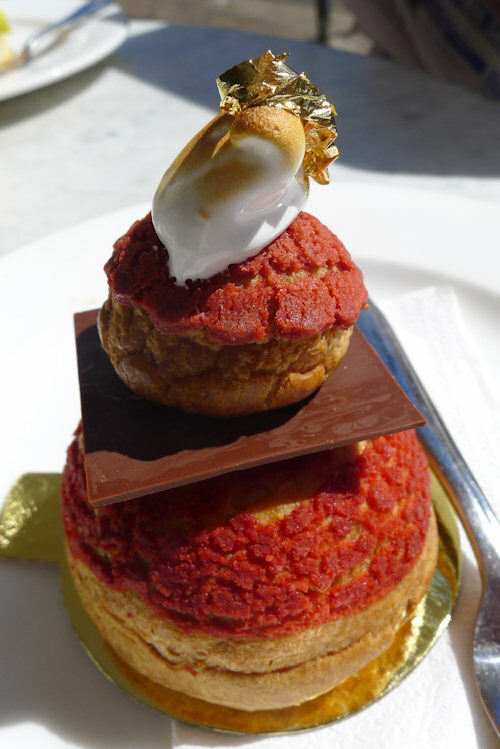 The two main layers of the bomb are comprised of a dense soft shell of thick choux cream with a thin later of raspberry coulis on the inner wall. The very centre is filled with a soft, chilled chocolate ganache that Dane would kill to have more of. This centre oozed out as we cut into the bomb and was not as sweet as we anticipated but worked very well with the raspberry flavours. The top has a small gooey meringue and some edible gold foil. This was a work of art that, after tasting, we did not feel guilty about demolishing – simply fantastic! 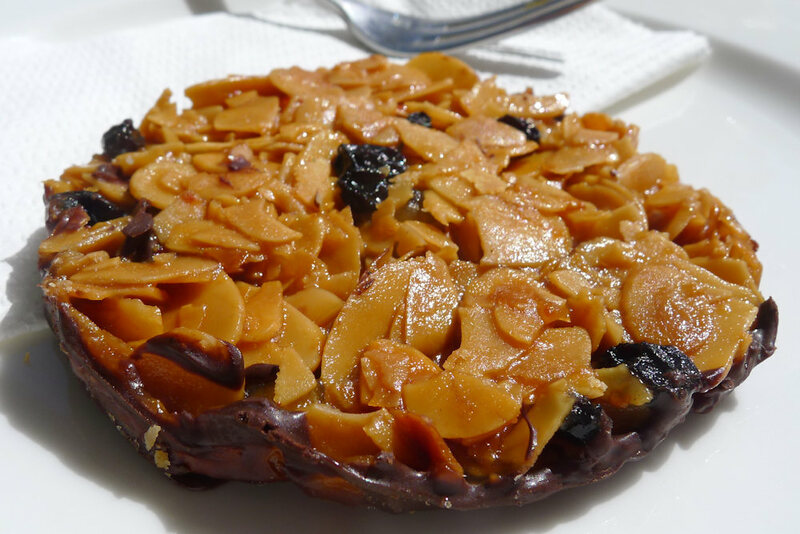 The florentine was eaten by one of our guests too quickly so unfortunately neither of us had a chance to try it! But reports state that it was held in high regard. One of the best they had tried in recent years. This is one of April’s dining highlights so far this year. 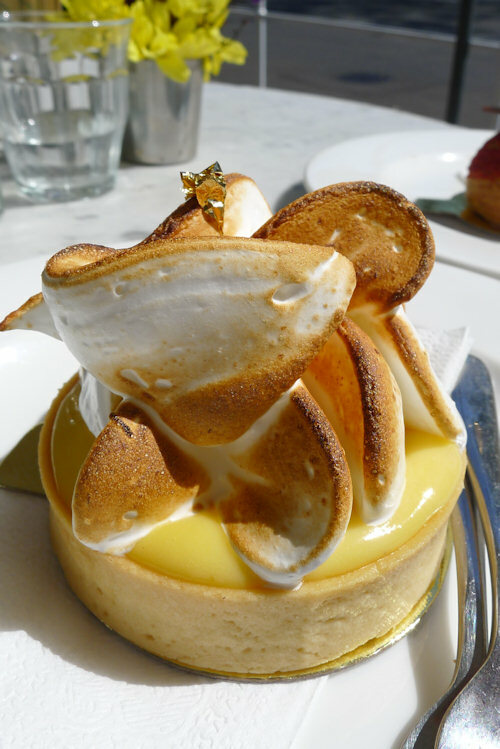 The passionfruit and lemon meringue ($6.50) was stunning. The usually tart lemon filling was replaced by a smoother and sweeter pasionfruit flavour which blended well with the fluffy meringue on top. It was a warm day so the components oozed into each other making for a heavenly experience. This dessert could have turned our visit into a scene from When Harry Met Sally. If you’re in Paddington, we recommend you do a self guided walking tour. There are so many gorgeous properties with immaculate gardens in the area. and also plenty of great shops to look in on Oxford Street. However check the price tag before you buy or you’ll be in for a nasty surprise!